Put simply, a tech pack (sometimes referred to as spec sheet or tech spec) is a document which outlines your design for the factory, in detail. For more information on what a tech pack is and why it’s important, you might want to read this article first. A common misconception is that a tech pack is created once and not changed again. This couldn’t be more wrong! Tech packs are constantly evolving and being updated as you go through the fit sample process and costing negotiations with the factory. In this post, I explain what each part of the tech pack is for, so that you have an understanding of what you might need to change as your product evolves. For this post I've used a basic examples of tech packs that I've created; the details have been changed for client confidentiality, so I wouldn’t suggest using any of the details here as it’s a mash up of different styles and won’t work as an actual garment! 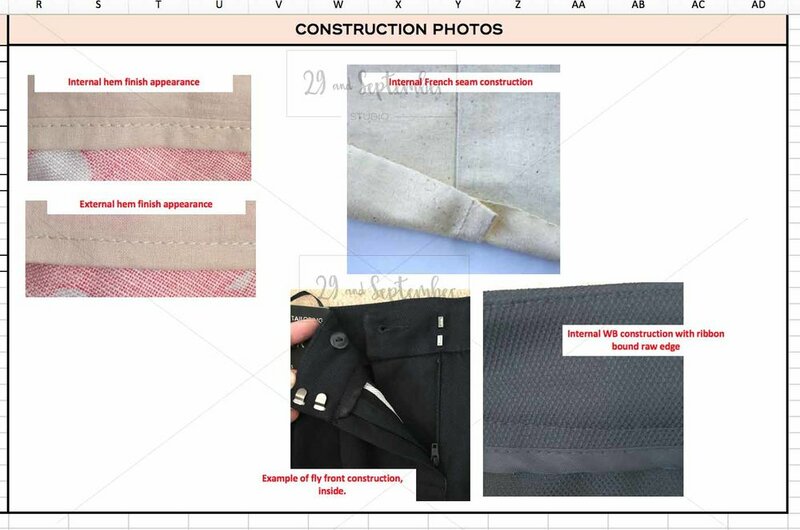 Different garment technologists will have a different approach to tech packs and the format may be slightly different to other tech packs you’ve come across, but the information here should be on any tech pack in one form or another. Even if the formatting is different to your tech pack, the overall content and the key things to look out for will remain the same. You'll notice that in each box I've written some suggestions. I tailor this for each of my clients to give them an indication of what information is required and they’ll then update when they have the confirmed details. Again, this is a mix of different styles, so I wouldn’t suggest following the measurements or components listed here! You’ll notice that some sections are left blank at the moment, for example ‘supplier’ in the example below. The supplier, along with other details are usually confirmed after the tech pack has been created, so these will stay blank until decisions have been made. Brand; pretty obvious but do make sure to add your brand name so that the factory can easily identify it as yours. Number of colourways - how many different colour and/or print options will this style be available in? Lead time - how quickly you expect the factory to send the next fit sample, after they've received your spec sheet (in the first instance) or fit comments. The length of time will previously have been agreed with the supplier in your contract or service agreement, but it's good to put it here as well so the person working on the development is aware and there's no excuses for it being late. Size range - which sizes will you be offering to customers? Sample size - what size should your fitting samples be in? Samples required - the more sizes you can try the better, in my opinion, but of course the factory will only agree to so many and often at a price. After initial fittings have been completed, I like to have a good sample of sizes so I can check the fit across the size break, but this isn't always possible depending on what you've agreed with the factory. After you've discussed how many samples you can have, you can enter your size requirements here. The size you ask for will depend on your brands customers, your fit model and your advertising model, if you have one. On this page, there should be a drawing of each of the colour and/or print options that are available. You’ll then want to update the colours of each fabric below - this may well get updated if your chosen colour is not available. POM shows the ‘point of measure’. You may amend this as you go through the fit process, if you add or remove elements. Original measurements will be for your chosen fit sample size and the first fit sample will be made to these specifications. 1st amended spec/2nd amended spec/etc - after fitting the item, you will use this column to request changes to the next sample. There can be a lot of changes throughout the fit process, so this is really important. It's difficult (read; virtually impossible!) to get a great fit the first time, because it's hard to predict how the fabric and components will react together (especially as the spec is usually done before the fabric is confirmed). Things like the weight of the fabric and amount of stretch can make the fit dramatically different, so make sure each sample is sent to you in the correct fabric. Plus, there’s so much sizing variation across brands, you’ll need to tailor the fit to your own specific fit model. Final spec - when you're happy with the way the garment looks, enter the measurements of that garment in here. The factory will use this to make bulk. Grade rules - these will alter depending on your customer and market. Grade rules dictate the difference between each size. If you're able to get extra samples made up by the factory so you can check that the style works in each size, that is preferable. If not, try to look at your market research and competitor methods to make a choice. You could also ask the factory for information on products they've done for other customers in the same market. Your product may require you to have multiple sets of grade rules, particularly if you’re creating a large size range or if you’re working on a children’s range. Tolerance - this is the maximum amount of difference that you are willing to accept between what you have asked for and what you receive. For example, if the measurement should be 40cm and the tolerance is 1cm, you may receive a garment that is 39cm or 41cm. This can alter the cost price a lot and generally the numbers here will be smaller for high end ranges and higher for budget garments. Tolerance is often something that is discussed at the contract stage with the factory as it's good to outline your expectations from the start. The exact headings here will vary depending on the product you’re making, but essentially this page is for describing the construction on each part of the product. I also use photo references when available, as a lot of the people I work with have English as a second language and I find it’s really helpful to get the idea across. Construction has a big impact on the price of the product, so you may well find the methods used change as the negotiations take place. Also, as there’s often several ways to achieve the same thing, the method may change if for example the factory is better placed to use one technique than another. Another reason for the change may be a reaction to your fittings and wear testing; you may find that you want to change the construction, to improve the quality or to better accommodate the final fabrics and trims selected. Depending on your brand and each style, you may need to add or remove components in order to make sure all of the relevant details are listed. Trims - As with fabrics, these will often start off as an initial idea and then get confirmed at a later date, when you’ll be able to fill in the supplier details, reference number and exact quality. If there’s a specific appearance I’m looking for, I’ll also add a photo reference and delete this when I add the supplier info. Labels and packaging - when the fabric is confirmed a care label can be created. You'll need to specify where you want this and any other brand/size labels. You'll also need to specify which labels to use and who will be providing them. You might want to add a photo reference of the design and or placement to accompany the text. Not everyone will require this page, as this is for any placement prints or embellishments; if the print or beading is on the fabric and placed at random, this will not require an artwork page. The artwork specification page has the measurements of the placement and any other info required. The information on this page is often updated, as the position may change as the garment changes during fitting. Also, the application method is often added later, due to the restrictions of print methods at different factories. Sometimes there will be a need for additional pages, or additional sections of pages, depending on the design and also the requirements of the company. Some may ask for an inspection of bulk, so a page will be created for the factory to write down their findings. Some people prefer to add an extra page for fit comments and space for photos. There can be variances but these are the key details to look out for. If you’re feeling a bit overwhelmed by this and would like some help with the production process, I’d love to help! I work with many brands on things like communicating with factories, improving product quality, keeping on top of production, fashion business strategy and more. If this is of interest, you can contact me by clicking here.